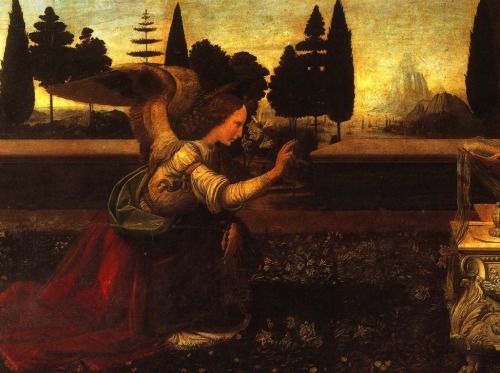 How many times have we seen this brilliant, transcendent image of Leonardo Da Vinci’s “Annunciation” and paused to consider the miracle moment when Mary was greeted by the angel Gabriel with the most astounding news? It’s the moment Mary said “yes” to God’s Word to her and nothing has been the same since. I am so grateful to have access to Leonardo’s sublime depiction of this unfathomable moment. The power of art to reflect and amplify can be profound and, in this case, provides a glorious tool for meditating on this Earth-altering event. I came across this post from Dominus Venustas and had to share her pairing of Leonardo’s painting with Roger Scruton’s quotes. Artists have followed the call of beauty and in doing so have given our world meaning. The masters of the past recognised we have spiritual needs. For Plato, beauty was the path to God. While thinkers of the Enlightenment saw art and beauty as ways in which we save ourselves from meaningless routines and rise to a higher level. Art and music shine a light of meaning onto ordinary life. Through them we are able to confront the things that trouble us and find consolation and peace in their presence. Dear Victoria, What a wonderful Christmas gift you have given me in this post! My heart is so moved. This is so true. I will remember to go to the gifts of music and art when my heart is heavy with the challenges and cares of this world, and when I am fighting a battle. Something in this post helped me know in a deeper way that they carry in them a power to overcome, and that power is a gift from God to us. Thank you and may you and your family have a blessed Christmas! Thank you so much for writing. I’m truly blessed to hear that you were touched by reading the post! It does take slowing down a bit to connect with the gifts that the arts provide to us, doesn’t it? It seems so easy to forget that in our complicated lives. And thank you very much for your kind Christmas wishes for us. May yours be blessed as well!